Baylor took another major step toward cleaning up the campus-wide mess left by former coach Art Briles and some players in the school’s football program on Friday when it announced that Ken Starr has left his post as a law professor at the school. Starr had been the school’s president and a chancellor from 2010 until being ousted as president and resigning as chancellor ealier this spring. And now he is out completely. Effective today, Judge Ken Starr will be leaving his faculty status and tenure at Baylor University’s Law School. The mutually agreed separation comes with the greatest respect and love Judge Starr has for Baylor and with Baylor’s recognition and appreciation for Judge Starr’s many contributions to Baylor. 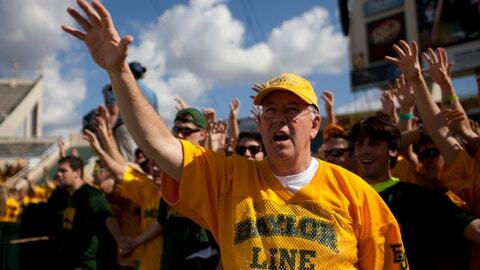 Baylor wishes Judge Ken Starr well in his future endeavors. Judge Starr expresses his thanks to the Baylor family for the opportunity to serve as president and chancellor and is grateful for his time with the exceptional students of Baylor University who will lead and serve around the world. The move is the latest act to try to clean up a school that was plagued by serious crimes committed by some members of the football team. Several players were arrested for (and a few convicted of) sexual assault and other domestic violence-related crimes under the reign of Briles. It was later uncovered that school officials were aware of many of the crimes, but some of the players went unpunished. Briles had his contract terminated in late May, and former athletic director Ian McCaw resigned a few days later. Jim Grobe will act as Baylor’s interim head coach for the 2016 season.